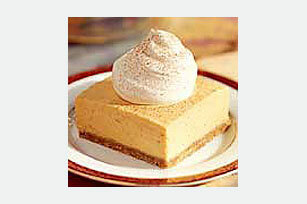 Make this Creamy Pumpkin Bar Recipe an autumn tradition in your home. This pumpkin bar recipe is chock full of PLANTERS Nuts and pumpkin spice. Mix crumbs, nuts, sugar and butter in 13x9-inch dish; press firmly onto bottom of dish. Refrigerate until ready to use. Beat cream cheese and 1/2 cup milk in large bowl with mixer until blended. Add remaining milk, dry pudding mixes, pumpkin and spice. Beat on low speed 2 min. or until blended. Gently stir in half the COOL WHIP. Pour over crust. Refrigerate 2 hours or until set. Top each serving with a dollop of remaining COOL WHIP just before serving. Serve this indulgent treat on special occasions. It's sure to be a hit with your friends and family. Spread nuts in single layer on baking sheet. Bake at 350°F 5 to 7 min. or until lightly toasted.